« Use Your Head… And Scrap Your Lead! Scrapping your metal is a fantastic and fast way to make a bit of extra money… Particularly if it’s been a bit of a tight month. Not only are you sure to make a quid or two for your own pocket, you’ll also be helping the environment. This is because recycling, even a little bit of metal, goes a long way when it comes to eco-benefits. However – if you’re not clued up on how best to scrap your bits, it can actually take up quite a bit of your time. You also run the risk of not getting the best value for your scrap metal. And this means you’ll potentially be missing out on even more money. Fortunately, if you’re visiting the J Davidson scrap metal yard in Manchester, you’re in for a quick, easy and profitable experience. Nevertheless, we’ve listed a few top tips to help make scrapping your metal even more simple, speeding things up along the way. This might seem time-consuming, but believe us – it’s better if you do it yourself. You’ll save time by sorting your scrap as you collect it; rather than waiting for it to build up and then tackling a huge pile of different materials. By keeping on top of it, you’ll be much quicker down at the yard; as you won’t have to wait for it to be sorted for you. You’ll also be aware of exactly how much of each metal you have ready to trade in, so you can predict a roughly accurate price for your scrap. If you’re planning on predicting a price for your scrap, you’ll need to know the rates first. Your best bet is to call ahead. This way, someone will be able to quote you over the phone. We always pay the best possible prices for all scrap materials; so you can save yourself even more time by giving our team a call first! It’s also worth asking if your materials might need cleaning before you arrive. If you want to get the best value for your scrap, some grades do need a quick clean before being traded in. It’s always worth finding out before you visit to save yourself a wasted trip, and guarantee the best prices. If you’re scrapping small amounts of different types of metal, then it’s likely you’ll have to spend more time at the yard. This is because you might be left waiting for each separate load to be assessed and weighed. A more time-effective option is to wait until you have a hefty amount of one type or grade. This way, you can then pay us just one visit for it to be weighed in and traded. 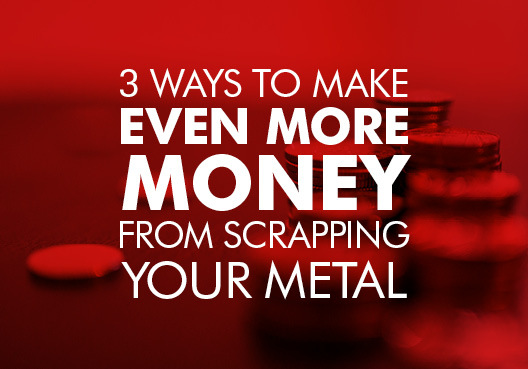 Follow these tricks and you’ll be tipped to make some serious money from scrapping your metal. If you’re ready to visit the yard or have any questions about the process, feel free to give our friendly team a call on 0161 928 9981. We’re always happy to help! This article was posted in Scrap Metal in Manchester, Scrap Metal Recycling. Bookmark the permalink. Follow comments with the RSS feed for this post.Both comments and trackbacks are closed.